The Click and Move system is the fastest and easiest way to motorize a headlight. 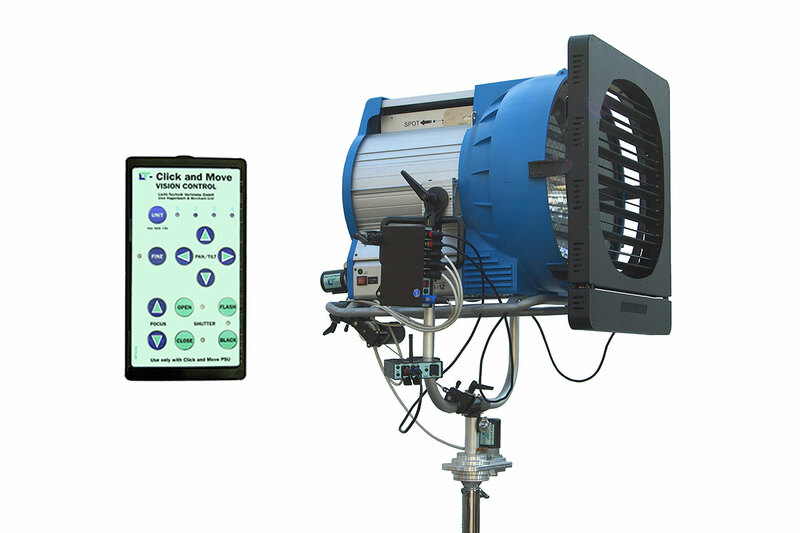 The unmodified lamp can be remote controlled by mounting up to three motors for Pan, Tilt and Focus. This is done with standard mafer clamps, no special tools or skills are necessary. All lamps with 28mm standard spigot can be used, up to the 18kW version. The lamp can be operated either in hanging or standing position. With the wired remote control up to 4 of the systems can be controlled. The cable connection is done with a standard 4pin XLR line. Optionally the wireless LT-Pilot can be used. A mechanical dimmer shutter is available for all sizes and controllable with the wired or wireless controller. All axis have electronical torque limiters which stop the concerning motor in case of overload. In addition the pan gearbox has a mechanical friction clutch.